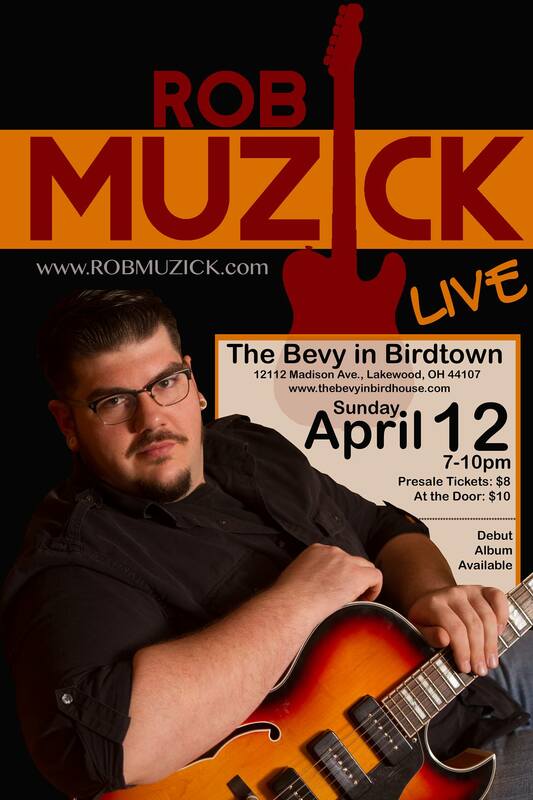 April 12, 2015 7:00 pm Rob Muzick CD Release Party / Thor Platter Band / Brent Kirby | LAKEWOOD, OH @THE BEVY IN BIRDTOWN | 12112 MADISON AVE.
Live this April, Rob Muzick returns to Cleveland to release his CD,”For the Heartache” at the fabulous new Bevy In Birdtown! Mark your calendars now for an evening of fun and festivities at Lakewood’s new hot spot, Bevy In Birdtown! Rob is excited to come home to Cleveland to debut his solo album “For the Heartache”. Having much success in Nashville, he felt passionate about sharing this debut with family and friends. Brent Kirby will open the evening pairing up with Chris Hanna on keys. Then, The Thor Platter Band will take the stage with some bluegrass for your soul. Chris Hanna, Paul Lewis and Rob Warth will be accompanying with Rob as well. Rob Muzick in town April 12th! This is going to be an EPIC evening that your not going to want to miss! Tickets are $8 pre sale. ( presale tickets include one complimentary raffle ticket) $10 at door. Rob will be raffling off an autographed Waterstone Trilby signed by all performers of the evening!!! Get your tickets now online at thebevyinbirdtown.com! CD;s will be for sale as well for $10. Check out Robmuzick.com, or follow him on facebook or twitter! Looking forward to seeing you all this spring, SUNDAY APRIL 12th.